Today is Katherine Guo Dan's 7th birthday. She opened a few more presents this morning, celebrated Chinese New Year at school, went to a pancakes and sausage feed for supper, and finished off the evening with a new book. So far, 7 looks pretty good. Katherine turns 7 years old tomorrow. She can't wait! I told her that the day before I turned 7 I cried and cried because I wasn't done being 6. 6 was still a little kid, but 7 was big and I still wanted to be little. She thought that was pretty ridiculous! We had her "family party" this evening. There were two cousins and a couple of aunts and Granny and Poppy and us. It was a fun little gathering. Katherine wanted a pirate party and insisted on wearing her pirate costume. Last night we made a pirate ship to serve as a decoration. I looked on the internet for pirate cake ideas and decided that all of the options were way out of my cake baking comfort zone. So Kate and I decorated her cake with a treasure map and she was pleased. It made for interesting cake cutting, as everyone requested a different section of the map. We had present opening time and checked out the gifts - books, puzzles, zhu zhu pet accessories, and other fun stuff. Granny, Poppy, and Aunt Robie just returned yesterday from two weeks in Hawaii and had fun Hawaiian gifts. The erupting volcano was a hit with all the kids! After most of the guests had left, Katherine settled down with her favorite present - a box of Playmobil pirate figures and all their detailed accessories. There will be many hours of imaginary pirate play in her future. It was a good day for my almost 7 year old pirate. This has become an accidental tradition. Saturdays just happens to be the day I have the most time in the mornings, therefore I take time and make the girls a hot breakfast. After drinking their milk and of course catching Elmo on Sesame Street, we head into the kitchen. If I even mention the word eggs, both the girls come running into the kitchen and say "help you mommy, help you." They are getting pretty good at if I do say so myself, their eggs are yummy! It doesn't get too much better than lazy Saturday mornings, soon enough the girls will be on their own and making me and Tony breakfast in the morning! January's My Kitchen My World destination is Denmark. I adore Denmark, and had the pleasure of visiting that beautiful country way back in the 90s. I hope to take my children there someday. I vaguely remember some stand out foods from my trip, but Danish food is something I don't know much and about and don't cook often, save for aebleskivers, and I was excited to try some new-to-me Danish recipes. 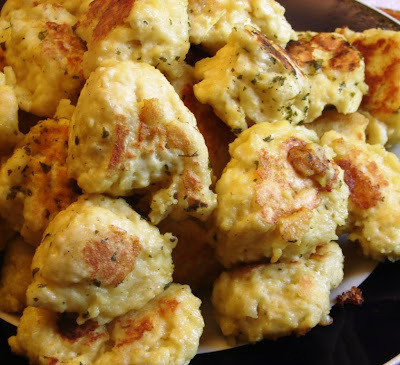 These fluffy Danish Dumplings are called Frikasséboller and were a huge hit with the whole family -- even picky husband loved them! Beat the eggs until light and fluffy. (I forgot to beat the eggs and just thoroughly whisked them together, and they were perfect) Add milk and mix well. 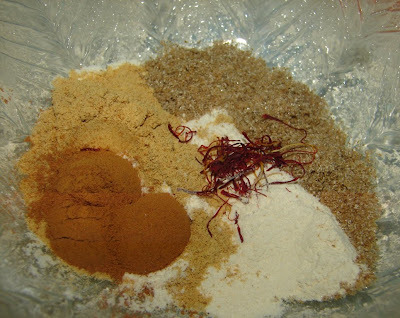 Sift the dry ingredients together and add to the egg mixture. Mix with as few strokes as possible. Drop by teaspoonful into boiling broth. 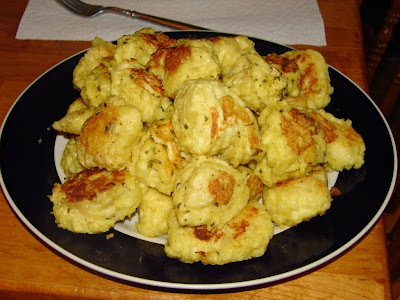 Turn the dumplings frequently so they will be done on all sides, but do not cook longer than 10 minutes or they will be tough. 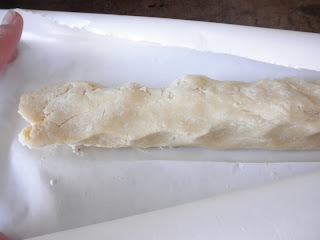 * After I removed these from the broth I browned them in a little butter in my electric skillet, mostly to keep them warm, but that gave them a nice little crust. Even though we ate these as is, they would be even better with a gravy of some sort. I'm sure I'll be making them again soon and will definitely make a gravy or sauce for them. The next dish I made was called Danish Christmas Red Cabbage, which was a big hit with everyone except picky husband, he is not a red cabbage fan, but the kids and I and my mom loved this one. 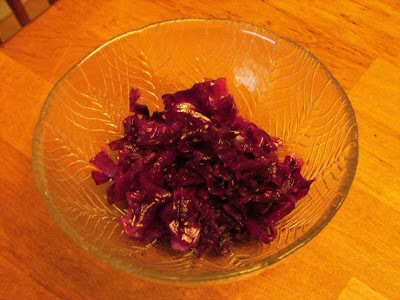 I grew up with cooked red cabbage, and this had a familiar flavor that I loved. Place the cabbage in a large saucepan, and stir in the sugar, vinegar, salt and water. Bring to a boil, then cover and simmer over medium heat for 1 hour. *I cooked it a little less than 1 hour, maybe 35-45 minutes, and it was perfectly done. This can be served immediately, or chilled and reheated later in smaller portions. The next new recipe I tried was Danish Glazed Mushrooms, the kids liked these, and although mushrooms are a favorite of mine, these were just okay for me, although they did look nice. Picky husband in not a mushroom eater so he passed on these. Clean mushrooms removing stems. Heat oil in a large non-stick skillet over medium heat. 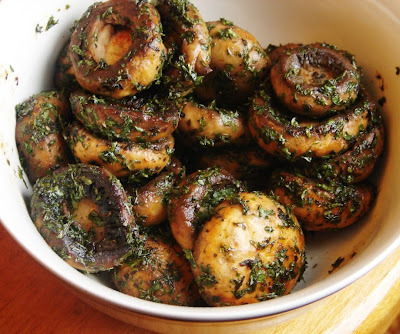 Remove mushrooms from heat. Toss in parsley, dill and basil. Serve immediately. 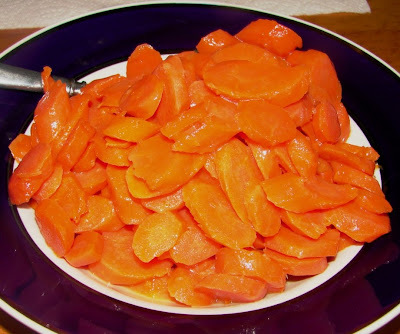 The last recipe I tried was for Danish Caramelized Carrots, these were delicious and a big favorite, especially with the kids. I was surprised to read the recipe and realize these were quite similar to my family's favorite way for me to make carrots, with a butter and brown sugar glaze. Peel carrots. Boil salt and water. Simmer vegetables for 20 minutes. To serve, heat sugar, stirring constantly until caramelized or lightly browned. Add butter. Add cooked vegetables. Shake pan or stir until evenly glazed and heated through, about 10 minutes. Serve immediately. 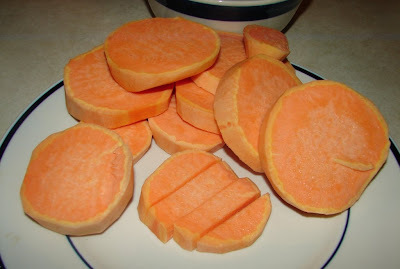 NOTES : This can be done with potatoes (up to 2 pounds, same recipe) as well as carrots. Sounds interesting with potatoes, will have to try that soon! Well, that concludes our Danish Dumpling Dinner, I had a lot of fun trying these Danish recipes and am so happy that the Frikasséboller were a big hit. Can't wait to try some more Danish recipes in the future as I day dream about a trip there with the family. 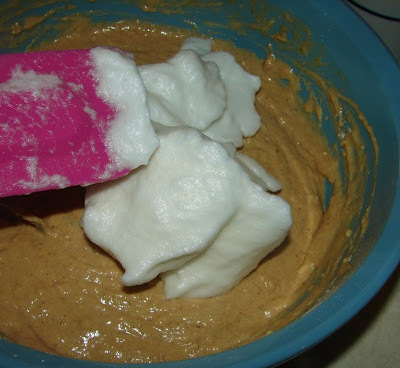 Combine flour, sugar, cornstarch, baking powder, cinnamon, salt, ginger and nutmeg in large bowl. Combine egg yolks, milk and pumpkin in medium bowl; mix well. 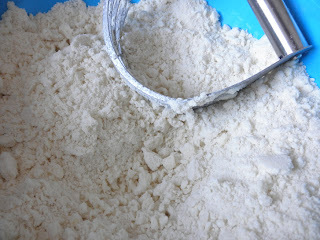 Add to flour mixture. Stir in butter. Beat egg whites in small mixer bowl until soft peaks form. 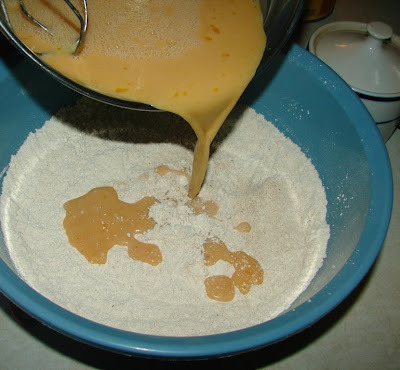 Gently fold into pumpkin mixture. Preheat waffle iron according to manufacturer's directions. Depending on size of waffle iron, pour 1/2 cup to 1 1/2 cups batter onto hot iron. Generously sprinkle with nuts. -- I left the nuts out of some for the kids. Bake for 4 to 5 minutes or until steaming stops. 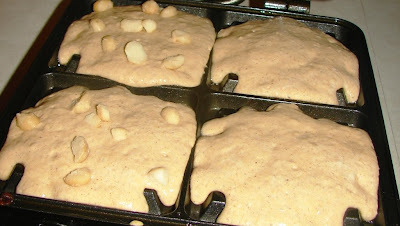 Repeat with remaining batter and nuts. 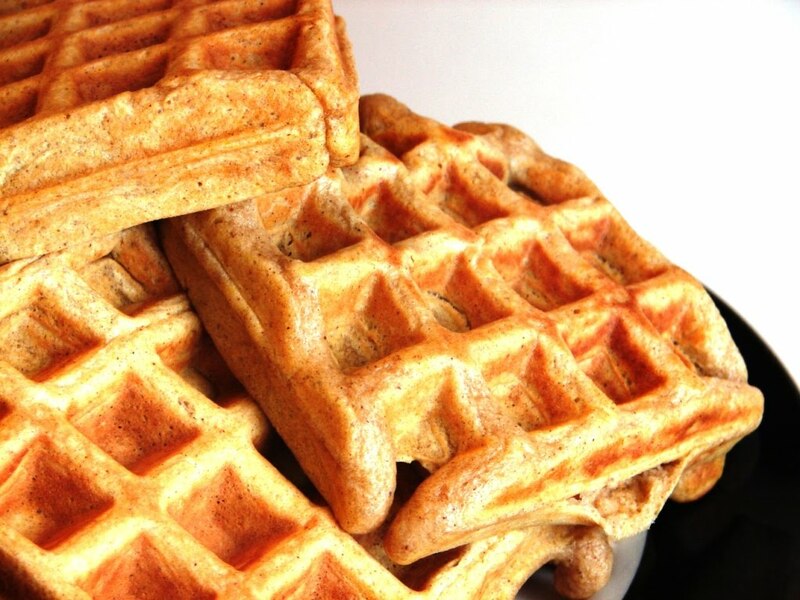 This waffle recipe gave us eight large, square, thick Belgian style waffles. The kids all liked them and two out of three kids requested seconds. 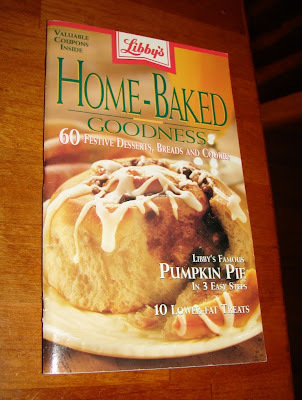 Picky husband would not try these, he thinks pumpkin only belongs in pie. I'll keep trying, pumpkin, I promise! 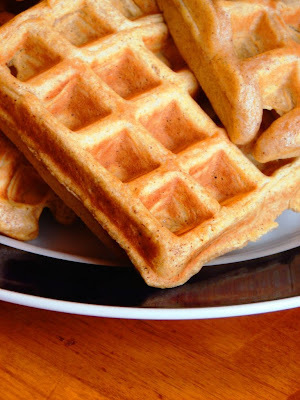 I know you are so good in both sweet and savory dishes for any meal and not just dessert :) I thought these were great and would make them again, although this is the first pumpkin waffle recipe I've tried in years so don't have much to compare it too. These were definitely a hearty fill-you-up type of waffle, great with a little butter, grade B maple syrup, and a big glass of milk. 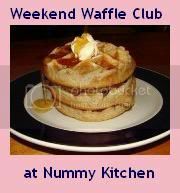 Please leave a link on your blog post to Weekend Waffle Club at Nummy Kitchen and leave a link to your post here with the linky widget. 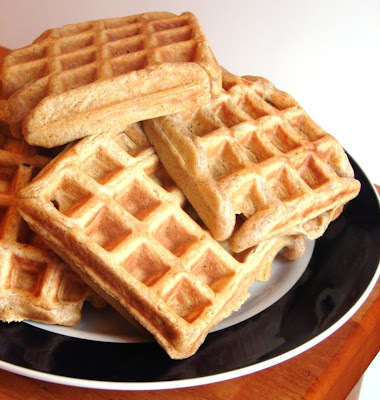 Next weekend I will post another waffle recipe and a cute little round-up of all of the waffles that you guys made and linked here, make sense? I hope so :) Let me know if you have any questions! You can leave your link here any time until next Saturday, February 5th. Someone lost something on the M25 !! I got this recipe from allrecipes.com who knows how long ago (http://allrecipes.com/Recipe/Grandma-Minnies-Old-Fashioned-Sugar-Cookies/Detail.aspx). 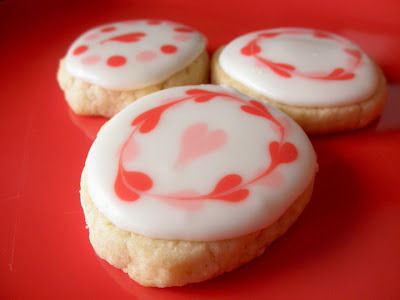 I felt like making some sugar cookies today, and so I pulled this one out. 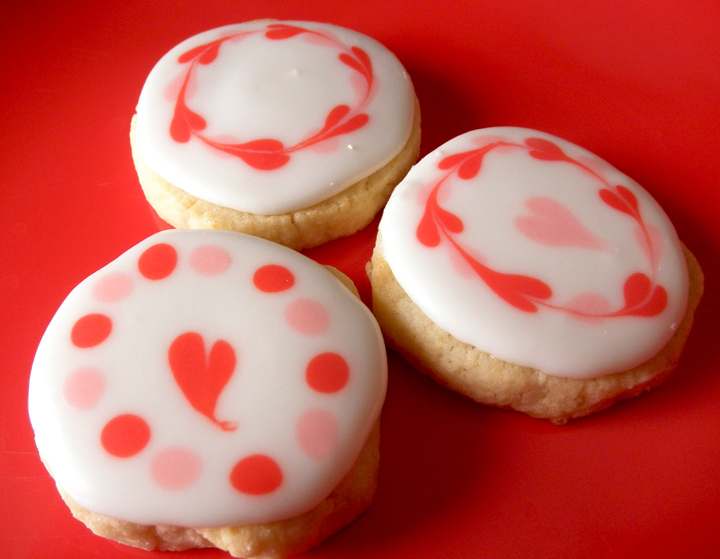 The two most noteworthy things about this cookie, besides its tastiness, is the fact that it are not very sweet, and it does not spread very much when baked. There is only one and a quarter cups of sugar for three cups of flour, and if you bake cookies regularly, you know that's a pretty low sugar to flour ratio. 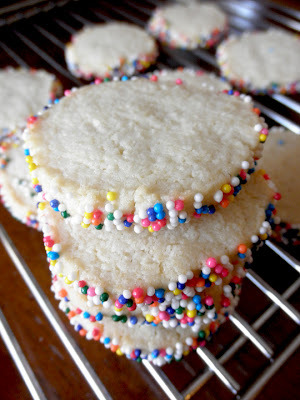 I used some cream cheese instead of butter/Crisco because I've tried that with some other cookies, and I found that it helped curb the spreading and it made the cookies taste a little bit more like the Pillsbury cookies you make from the tube o' dough. 2. Sift together flour, sugar, baking powder & salt. (I do this by putting them all in a large bowl and stirring with a whisk.) 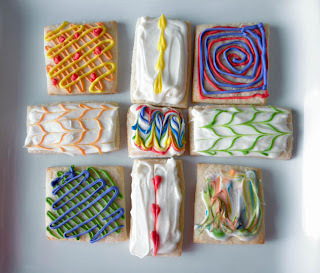 Cut in butter, Crisco, & cream cheese and blend with a pastry blender until mixture resembles cornmeal. Stir in lightly beaten egg, half & half and vanilla. Blend well. After blending in the butter, Crisco, & cream cheese, this is what you get. I used a sheet pan to help even out the log. It was too hard to explain how I did it, though. 4. Cut refrigerated log into 1/4 inch slices. 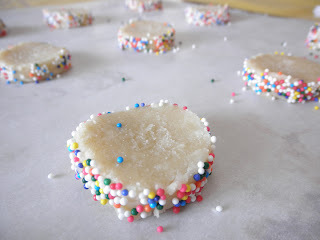 Roll each cookie edge in nonpareils. 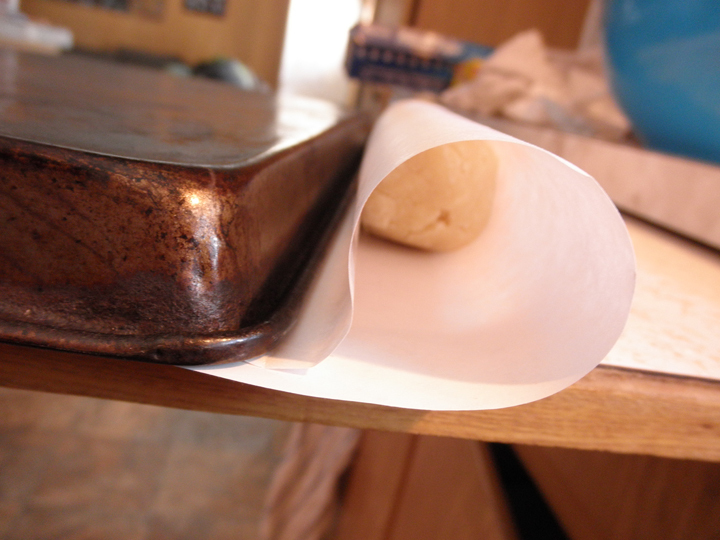 Place 1 inch apart on a parchment-lined cookie sheet. 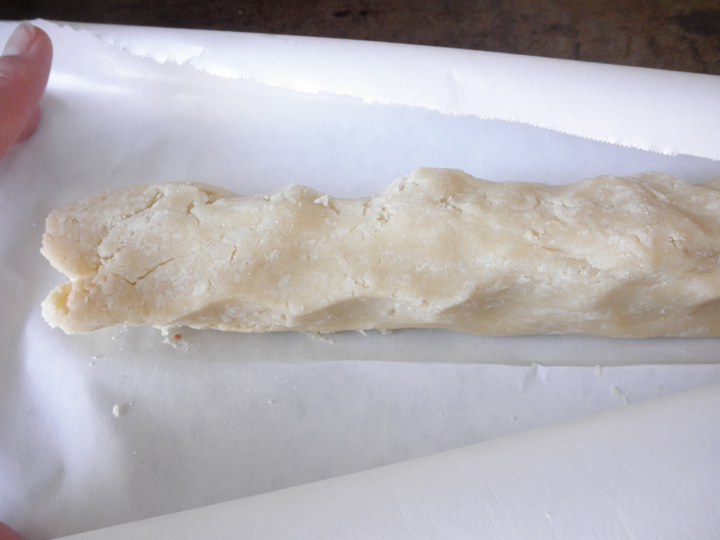 Bake for 6-8minutes, or until delicately browned on the edges and bottoms. The nonpareils are a little out of control on the cookie sheet. Just having some more fun with frosting. These are by 8-year-old Ezra. 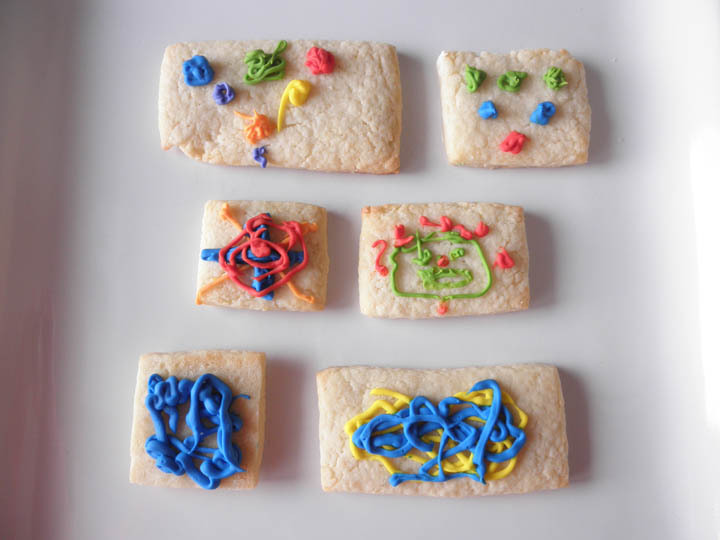 More fun with sugar cookies & frosting. Time for French Fridays with Dorie! Our recipe of the week is Chicken B'Stilla. I switched it up a little bit to make a vegetarian version with roasted sweet potato cubes and garbanzo beans instead of the chicken. 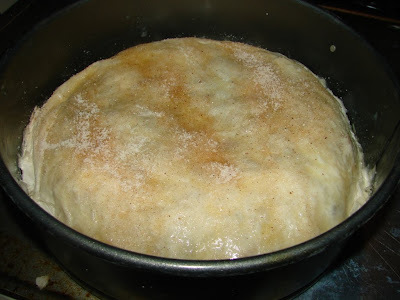 I had never heard of B'Stilla (aka bastilla) until this recipe came up. 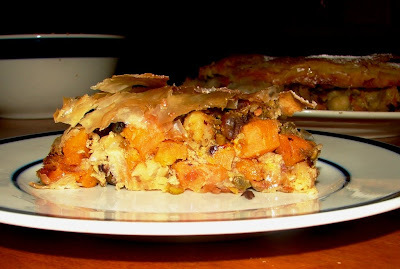 It is kind of like a Moroccan pot pie with a phyllo dough outer crust and and egg based sauce for the filling. At first I was going to swap out the chicken for red lentils and garbanzos but decided against the lentils since I thought they'd just absorb too much sauce and get mushy. Instead I went with diced sweet potato that had been roasted with all of the spices in the recipe that are supposed to be cooked with the chicken. 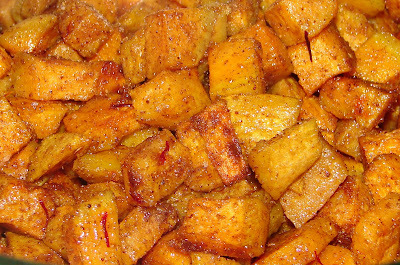 I tossed the potato cubes in olive oil and coated them in the spice mixture before roasting for 20 minutes to get them just tender. While the potatoes were in the oven I made the sauce which I think I ended up with too much of. 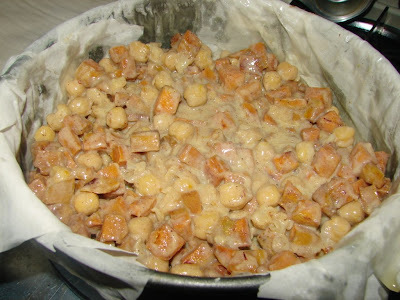 I strained the sauce into a measuring cup and had almost two cups, but when adding the sauce the the sweet potatoes and garbanzos decided to use only half of the sauce, so one cup. 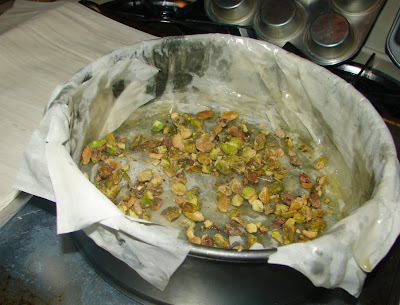 Another tiny change I made was to use pistachios instead of the almonds. I believe the almonds are the traditional nut in this recipe, but I had just run out of almonds and had the right amount of pistachios handy so decided to use those. Pistachios are a common ingredient in Moroccan dishes, so I felt this was an okay substitute. Buttered and sprinkled with cinnamon sugar...love the savory sweet combo! The B'Stilla is then baked until golden brown and crispy crunchy. Here is where I got to have some fun -- while researching bastillas and photos of bastillas I came across a photo of a bastilla from a Moroccan restaurant called Casablanca. 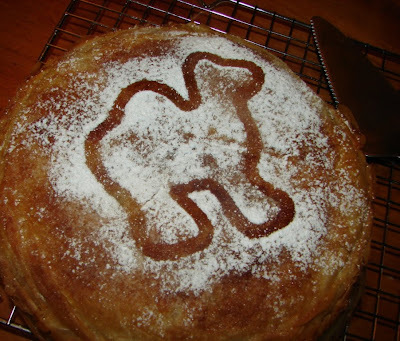 The bastilla top was dusted with powdered sugar and had two camels stenciled on the top along with the name of the restaurant. 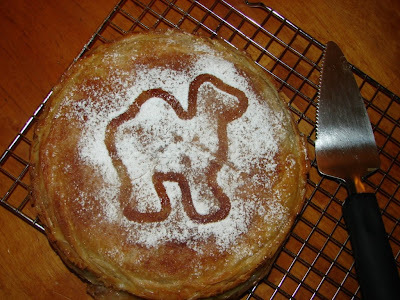 I immediately thought of my camel cookie cutter that I've never used but have had for years. 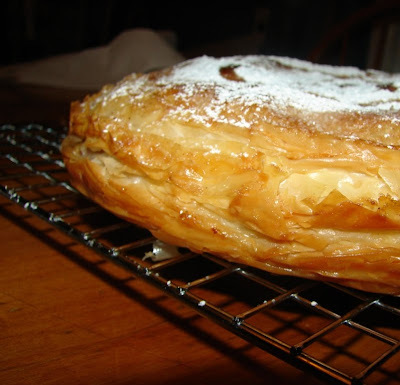 I pulled it out, set it down on top of the baked bastilla and dusted on some powdered sugar. Too fun. The kids loved the camel. The kids did not love the bastilla :( They had a few bites but were not liking it. Picky husband was working so we didn't have to worry about him. I thought it was delicious and the only thing I didn't really care for was the eggy sauce -- but I know that is a main component of the recipe, and even though I didn't love the sauce, it didn't stop me from enjoying a big slice of bastilla. I loved all of the flavors and would love to make something like this again. While I realize this is no where near a true Moroccan b'stilla, it was still fun to try a vegetarian version and learn about a dish I had never even heard of before. This delicious, super-easy-to-make pasta is a simple dish with one very important addition - bacon!! Put a large pot of water over high heat and bring it to a boil. Add the salt, then add the spaghetti and bring back to a boil. Stir once, turn the heat down a little, and boil until pasta is tender. While the pasta cooks, start the sauce. Mince the garlic and chop the bacon into small pieces. Heat a large frying pan over medium heat, then add the oil. After about 30 seconds, add the chopped bacon and the garlic. Fry for 8-10 minutes, or until the bacon is golden and crisp and the fat has run out. Take the pan off the heat. While the bacon cooks, finely grate the Parmesan cheese and beat the eggs in a measuring cup with a fork. Mix half of the Parmesan into the eggs. Season with salt and pepper. When the pasta is done, reserve a cup of its cooking water, then drain the rest of it out. Add the pasta to the bacon pan, add 2 tablespoons of the reserved cooking water, then pour the egg and cheese mixture over it. Toss everything together quickly, so that the egg mixture, bacon and its juices coat the pasta. The residual heat in the pan and the pasta will be enough to just cook the eggs to a creamy sauce within about 1 minute. 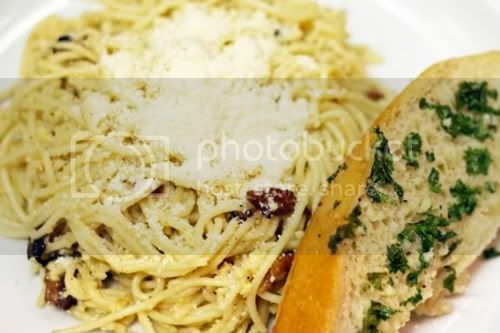 Serve topped with the rest of the Parmesan cheese and a little black pepper. We have had a lot of cold, gray weather here lately. We've all been a little stir-crazy because it's been too cold to go outside much. But earlier this week we'd had enough. So, we dug out the long underwear, bundled up as best we could, and went to the park. Never mind that is was 25 degrees out and the windchill was somewhere below that. I must say, it was a lot of fun! And since it was so unpleasant out, we had the entire park to ourselves. Now that's a rare treat! We stayed until our faces were frozen.